This dark red outsole embodies our commitment to quality. Like the heel, it is made from extremely durable leather, combining the utmost functionality with a gorgeous look that evinces our attention to detail. From the dynamic front section to the lovely counter, the shoes in our Goodyear Flex collection are made entirely from premium leather, from heel to toe. Highly breathable orange lining adds a touch of stylish refinement. The Goodyear welting production method guarantees a certain elasticity — particularly at the front of the shoe — that knows no equal. Men’s shoes made in this manner are extremely pliable and flexible. Our most comfortable business shoe ever! Experience incomparable wearing comfort in the exclusive models from our Goodyear Flex collection. 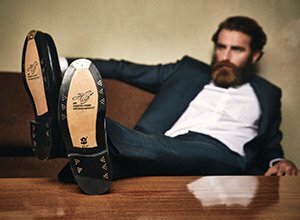 These sophisticated men’s shoes have all been made using the extremely meticulous Bologna production method, combining the highest degree of flexibility with a classic look and feel. Enjoy total comfort with every step! Our Goodyear Flex collection consists of selected classic men’s shoes that are every bit as flexible as a pair of trainers. As far as design is concerned, these perennially popular iconic models hew entirely to tradition, topping off their extraordinary wearing comfort with a wholly stylish appearance. From a traditional toe cap seam, to subtle perforation, to striking buckle closures, classic men’s shoe design goes well represented in our Goodyear Flex collection. These highly versatile models can be worn with a wide range of apparel.